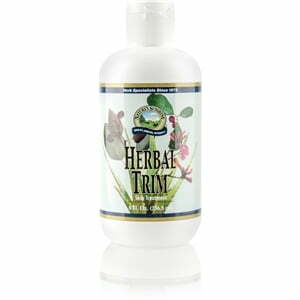 Nature’s Sunshine Herbal Trim® Skin Treatment combines soothing Aloe Vera to help moisturize dry skin, along with other herbs and nutrients to help the skin feel fresh and healthy. Since the skin is an organ, keeping it healthy is crucial. The skin helps keep the internal organs from injury, along with getting rid of unusable substances from the kidneys, lungs, and other organs, as well as regulating body temperature. Nature’s Sunshine Herbal Trim® Skin Treatment is designed to benefit this vital organ. 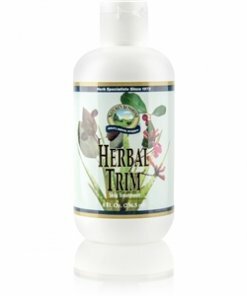 Herbal Trim® Skin Treatment contains aloe vera, water, pau d’arco extract, lobelia extract, xanthan gum, citric acid, Tei Fu oil blend (includes menthol, eucalyptus, wintergreen, camphor and clove oils), allantoin, hydrolyzed soy protein, safflower seed oil, lavender oil, carrageenan, and soluble collagen. For external use only. Water, aloe vera extract (Aloe barbadensis), citric acid, pau d’arco extract (Tabebuia heptaphylla), lobelia extract (Lobelia inflata), xanthan gum, hydrolyzed soy protein, allentoin, Carthamus tinctorius (safflower) seed oil, menthol, Eucalyptus globulus (eucalyptus) leaf oil, Lavandula officinalis (lavender) flower oil, Cinnamonum camphora (camphor), Gualtheria pro-cumbens (wintergreen) oil, Syzygium aromaticum (clove) oil, marine colloids, hydrolized collagen, diazolidinyl urea, sodium benzoate, potassium sorbate, and ethyl alcohol.